An ultra-cool winter experience! The Hôtel de Glace in Quebec City, Canada is open now through March 28, 2016, and this year’s theme is winter’s rivers. 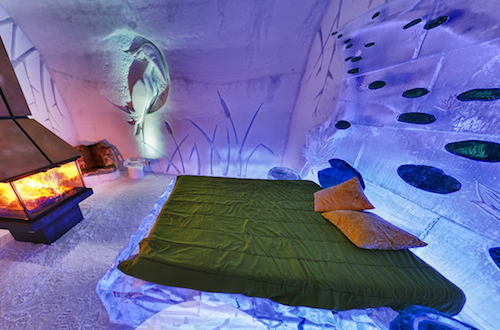 The 44 rooms and themed suites have beds carved out of solid ice with a wooden bedspring and mattress on top. Arctic sleeping bags keep you toasty in temperatures as low as -30°C. Some of the room even have fireplaces and private spas. The hotel includes a bar, chapel, and cafe. A chilling experience to remember!